Cleaning out your PC on a regular basis creates drive space and helps it run better / faster. One of the easiest ways to clean up files you no longer need is by using Disk Clean-up. 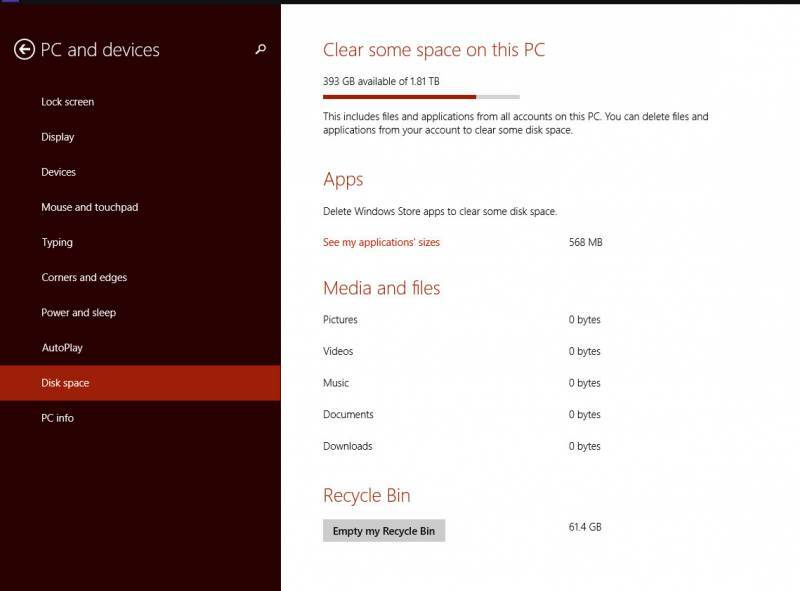 WIndows 8 – To open Disk Cleanup from the desktop, swipe in from the right edge of the screen, tap Settings (or if you’re using a mouse, point to the lower-right corner of the screen, move the mouse pointer up, and then click Settings), tap or click Control Panel, type Admin in the Search box, tap or click Administrative Tools, and then double-tap or double-click Disk Cleanup. Windows 8.1 / 10 Search for disc cleanup using the search box. If prompted, tap or click the drive that you want to clean up, then tap or click OK. In the dialogue box in the Description section, tap or click Clean up system files. Administrator permission required. You might be asked for an admin password or to confirm your choice. In the Disk Clean-up dialogue box, on the Disk Clean-up tab, tick the check boxes for the file types that you want to delete, then tap or click OK.
Go back to Computer in File Explorer, tap or click the drive you cleaned up, then tap or click Refresh.